A Fleet of Fish Trucks and a Boat. However, he says he’s always liked to do physical and outdoor things, and he apprenticed with Mackinaw City’s Bell’s Fishery for 10 years as a young man. There he acquired a taste for fish (he now likes nothing better than delicacies such as trout and walleye cheeks) and learned enough about the fish business to start his own. “I was 26 when I started this business, in a building near my home, and I was terrified.” But he figured that he knew enough people to supply the fish, and he could figure out a way to sell them, even if it were to people in the next door campground. 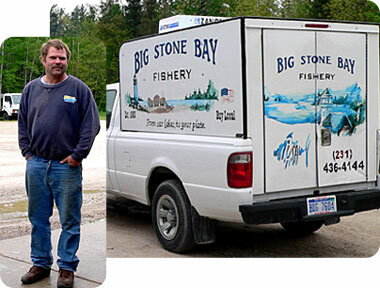 He’s proud of his Big Stone Bay crew, whether they are cleaning, filleting, packing fish into boxes or loading them into his large, white, distinctively painted fleet of trucks. McMurry’s family likes fish and some are also involved in the business. One of his daughters regularly helps with bookkeeping and paperwork, and one of his sons is getting involved with him, too. They’re excited about starting a chub fishery on Lake Michigan. Perhaps a second generation of McMurrys will sustain the business their father started. This story posted in Fishing Families on Great Lakes Whitefish website (view PDF version of original web content). A variation of this profile is also published online by the Michigan Fish Producers Association ('The Fishermen' ).